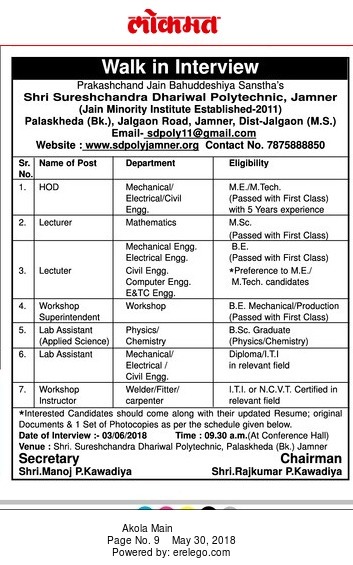 Shri Sureshchandra Dhariwal Polytechnic, Jalgaon has advertised in Lokmat newspaper for the recruitment of Lecturer plus HOD job vacancies. Interested and eligible job aspirants are requested to appear walk in 3rd June 2018. Check out further more details below. About College: Shri Sureshchandra Dhariwal Polytechnic, Palaskheda(bk.) is established on 2010 by Prakashchand Jain Bahuddeshiya Samstja,Jamner ( Minority Institution), founded by President Shri. Rajkumar Prakashchand Kawadiya in Jamner with the sole objective of promoting quality education to the young and deserving students in the field of engineering and technology.